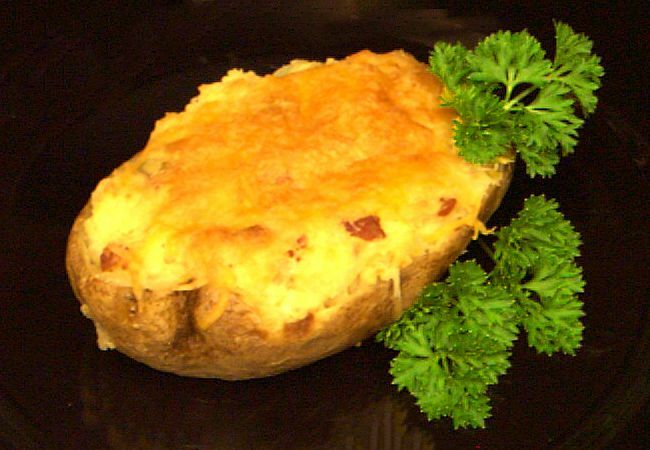 Bacon Cheddar Twice-Baked Potatoes Recipe. A comfort food for many, these twice-baked potatoes are kicked up with bacon, Cheddar cheese, Parmesan cheese, sour cream and chives. This recipe may be made in advance and cooked later. Rub potatoes with olive oil and sprinkle with kosher salt. Prick in several spots with a fork. Place on a shallow baking pan 6 inches apart and bake until center is soft, 45 minutes to 1 hour. When potatoes are cool enough to handle, slice each one in half lengthwise. Carefully scoop out the soft flesh, leaving a 1/4-inch rim around the potato skin, and place flesh in a mixing bowl. Set skins aside to stuff later. Mash the potatoes with a fork or masher (do not use a mixer). A few small lumps are good for flavor and texture, so do not try to get them perfectly smooth. Stir in bacon bits, 1 cup shredded Cheddar cheese, sour cream, chives, salt, and pepper . Spoon or pipe mashed potato mixture into the potato skins and return to the baking tray. Return to the 400-degree F. oven and bake about 30 minutes until potatoes are lightly browned and heated through.